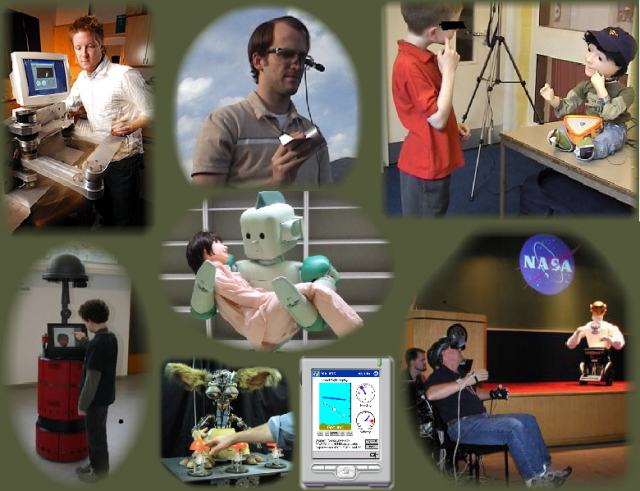 (center) physical interaction with the RI-MAN robot . Autonomy is only one of the components required to make an interaction beneficial. A second component is the manner in which information is exchanged between the human and the robot. Efficient interactions are characterized by productive exchanges between the human and robot. Measures of the efficiency of an interaction include the interaction time required for intent and/or instructions to be communicated to the robot , the cognitive or mental workload of an interaction , the amount of situation awareness produced by the interaction  (or reduced because of interruptions from the robot), and the amount of shared understanding or common ground between humans and robots[106, 107] jumpers for sale . physical interaction and haptics, frequently used remotely in augmented reality or in teleoperation to invoke a sense of presence especially in telemanipulation tasks [12, 118] and frequently used proximately to promote emotional, social, and assistive exchanges [119-122]. Recently, attention has focused on building multimodal interfaces , partly motivated by a quest to reduce workload in accordance to Wickens’ multiple resource theory  and partly motivated by a desire to make interactions more natural and easier to learn [124-126]. The format of the information exchange varies widely across domains. Speech- and natural language-based exchanges can be scripted and based on a formal language, can attempt to support full natural language, or can restrict natural language to a subset of language and a restricted domain (see, for example, [52, 127-130]). Importantly, speech-based exchanges must not only address the content of information exchanged, but also the rules of such exchange a lá the Gricean maxims , which ask to what extent the speech is truthful, relevant, clear and informative. Haptic information presentation can include giving warnings through vibrations, promoting the feeling of telepresence, supporting spatial awareness through haptic vests, and communicating specific pieces of information through haptic icons (see, for example, [132-134]). Audio information presentation can include auditory alerts, speech-based information exchange, and 3D awareness (see, for example, ). Presenting social information can include attentional cueing, gestures, sharing physical space, imitation, sounds, facial expression, speech and natural language [135-142]. Finally, graphical user interfaces present information in ways that include ecological displays, immersive virtual reality, and traditional windows-type interactions (see, for example, [27, 108, 109, 143]).